Yesterday I traveled back form Rhode Island to return my car to the great state of New York. I returned only with the clothes I left with and a little care package from my Aunt Pauline: some authentic Woonsocket style Dynamite mix, sealed in a little Tupperware container and ready for use. Today we spent all day driving all over Westchester to look for a new apartment so when we returned home it was a perfect night for said dynamites. Firstly, they are delicious. Secondly, they required little to no additional work to prepare. Perfect for a day where Jen and I were both physically exhausted form the mental workout of deciding where to move. Aunt Pauline's dynamites use the traditional green peppers along with celery (an ingredient I forgot in the version I made last week). I also made a salad from the remaining farm share greens and tomatoes as an accompaniment. Dynamites must be served on these rolls. 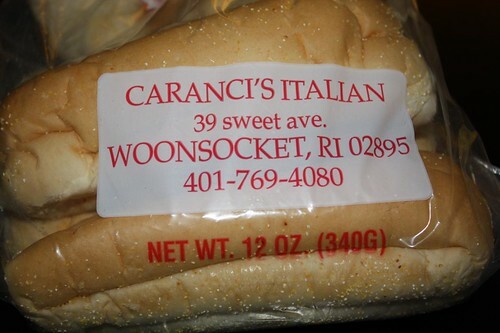 They are from Dupras Bakery in Woonsocket, RI and inexplicably say "Caranci's Italian" on them with the address of Dypras Bakery listed below. I never really understood this. There are only two and a half Italian people in Woonsocket: My mother, my friend Keith from high school, and .5 of me. I'm not sure who this Caranci character is but that is a French Canadian bakery if I've ever seen one. 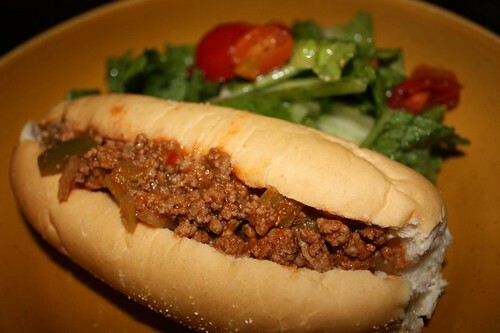 Also, Italians don't make rolls like this -- no one outside of Woonsocket does. I guess like most ethnic cuisines this dish is largely tied in to local agriculture and culinary custom, making it difficult to duplicate outside its geographic home. (Read about my solid attempt to recreate it last week.) Sort of like the "New York System Weiner" which is native to Rhode Island and, strangely, does not exist here in New York. I wonder if the many mothers and aunts of Woonsocket would consider going into some sort of mail order business to supply their scattered relatives with some authentic dynamite mix. Sort of like Omaha Steaks. Rising From The Ashes . . . of SOUP!